Another hit from the boys at Focusrite, the Saffire is great for professionals and hobbyists alike. 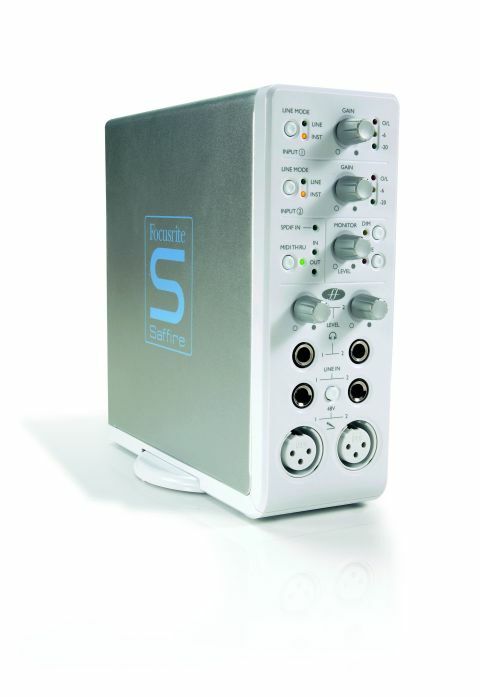 Focusrite sound quality in a stylish and portable box. Separate mixes for both engineer and performer. Front panel monitor controls for Level, Dim and Mute. DSP effects also supplied as host-based plug-ins. Balanced outputs too loud for some equipment. Headphone outputs only just loud enough. The Saffire stands vertically and is ideal for desktop use. Sort out your routing with the SaffireControl Virtual Mixer. A suite of DSP-powered plug-ins comes included. The mere mention of the name Focusrite gives professional sound engineers a warm, fuzzy feeling in their loins. Why? Because its equipment usually looks great on paper and sounds fantastic in practice. The Saffire is a 2-in/8-out FireWire audio interface that also sports stereo coaxial S/PDIF connectors (so that's 4-In/10-Out for those of you who can put them to good use). Despite looking huge in its publicity photos, the unit is actually very diminutive and light, and only about the size of two hardback books. The Saffire is designed to be placed within arm's reach during use - it has front-panel controls for Monitor Level, Mute, Dim, MIDI Thru and Input Gain (for which there are two controls). There are two separate headphone sockets with individual level controls, and it's a joy to discover that these can feed independent mixes to different musicians. More than just an I/O box, the Saffire features four types of signal processing: EQ, compression, amp simulation and reverb. Thanks to the built-in DSP chip, these effects can be used on the input channels, and they're also supplied as useful native plug-ins that will operate completely independently of Saffire. You can install and register the plug-ins on several different computers, and can even ask Focusrite for further licenses if they're needed. It's perfectly safe to record through the input effects; in a flash of inspiration, Focusrite have made inputs 3 and 4 unprocessed versions of inputs 1 and 2. These can be recorded, so you can 'undo' your processing later. Alternatively, inputs 3 and 4 serve as the coaxial S/PDIF digital input, which we're pleased to see is synchronised rather than being sample-rate converted. The SaffireControl Virtual Mixer configures the interface and enables you to control the direct monitoring. This is very limited on some interfaces, but thanks to the mixing and DSP within Saffire, it becomes a very practical proposition here. Coupled with the mirrored 'clean- feed' inputs and the option to provide separate mixes for different musicians, this means you can work with players who are sensitive to the latency introduced by native plug-ins. The loudspeaker monitor level control can be assigned to any output pair, which is handy for when you want to do a spot of surround mixing. However, the Mute and Dim buttons only work on the front stereo speaker outputs, which is rather odd. The only other Control Panel for Saffire is a small drop-down list of latency values, which you would obviously set to the lowest value that your computer can handle without pops and clicks occurring. This list is all that appears when you launch the ASIO Control Panel from within your music software. Of course, all the above functionality would be irrelevant if the sound quality was substandard. Fortunately, Saffire excels in this area - not just on the outputs, but on the inputs too. The unit features top-notch Focusrite microphone preamps and the DSP processing is up to the company's usual high standards. The output level on the output sockets of Saffire is high - very high indeed (16dBu at 0dBFS, for the technically-minded). This is far too high for most consumer equipment to interface with, and unfortunately there's no option to switch it down to the -10dBv that such equipment requires. The virtual mixer faders don't really solve this problem, since mode changes cause these to shoot up to full volume, possibly frying your loudspeakers as a result. Strangely, though, the headphone outputs are a bit on the low side. A well-compressed final mix will be more than loud enough, but most recording doesn't take place under such ideal conditions, so you may have to adopt some creative workarounds. We should also mention that only a 6-pin FireWire cable is supplied, so you'll need to buy another cable if your laptop has a 4-pin port. Despite these slight reservations, there's no denying that the Saffire is a pro-quality audio interface. It's well-built and sounds excellent, and that's what really matters.